The victory dance may be premature, says ex-CIA analyst Ray McGovern. 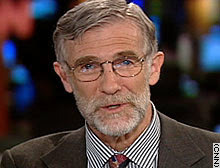 Ray McGovern was chief of the CIA’s Soviet Foreign Policy Branch in the early Seventies, and served at CIA for 27 years. He worked on the President’s Daily Brief under Presidents Nixon, Ford, and Reagan. He now works with Tell the Word, a publishing arm of the ecumenical Church of the Saviour in inner-city Washington.